Home » Product review » Honeywell HPA060 Review – Is It A Good Buy? There are quite a few small room air purifiers on the market. But which ones are worth buying, and what do you need to know? In my Honeywell HPA060 review I’ll share with you much more about this interesting little model. In case you weren’t aware, the company has a whole series of similarly styled air purifiers with high quality and good performance. But like anything else, there are always things to know before you spend your hard-earned money. As I’ve owned and tested it, here’s my chance to help you by giving you my hands-on testing experience and honest opinions. Read on to find out all the details you need. The HPA060 is one of several models in Honeywell’s HPA series of air purifiers. As you can see, they’re quite similar in styling, but it goes beyond that. They use a modular filter design to share the same filters between different models. The HPA060 is actually a shorter version of the HPA160 “tower” purifier. This means it’s rather slender and taller than it is wide. Like the other models, it’s a good-looking unit and features a nice satin silver finish on the controls with a gloss black inset panel. It’s actually one of the many models produced by Honeywell in the HPA series of air purifiers. As the “little brother to the HPA160 (medium to large rooms) and the HPA200 (large rooms), it’s designed for small rooms about 70 square feet in size. Just like the other models, it use a true HEPA filter and a separate pre-filter to clean the air and permanently remove nasty things like allergens, dust, pet dander, and even odors. The model works by moving your room’s air through a “true” HEPA filter that’s highly efficient at removing nasty particulates in the air. Many air quality problems are caused by particulates that are microscopic in size. The pre-filter works alongside the main HEPA filter by capturing odors and larger elements like hair and dust. This particular model is somewhat similar to the competing GermGuardian AC4100 in that it pulls in air from the rear and blows it out the front. Room air moves through the filters then blown out to produce clean, fresh air in the room. Controls are extremely simple – there’s a 3-position rotating switch on top. A blue indicator illuminates for the current switch position & fan mode. I finally got the HPA060 in my hands after a little bit of a delay, but in time for the weekend! Upon opening it I saw the same level of quality as in other models. For example, the the larger HPA160, it’s bigger brother for medium or large rooms. The packaging was well-done and appeared to be from recycled cardboard material. A nice customer support phone number note was included on top. It looks great and it’s well put-together. I didn’t find any issues with the build quality. Panels are lined up well with no large gaps. It feels solid to the hands and not “hollow” like a few other products I’ve tried. Nice! As is standard practice for me, I unpacked it and got to work checking out the build quality. I’m happy to say, after owning and reviewing several of the company’s products, that quality is consistent. The box is great as well, and clearly indicates the features, room size, and replacement filters you need. I don’t understand why more companies don’t do the same. Just like with the other models I’ve reviewed, I can tell that someone put effort into the design and quality control during production. The styling is especially good, as it looks classy and modern, not cheap like some other products I’ve seen. It’s clearly not a copycat of other products on the market, but an original, good design. At a measured 6.6 lbs (2.99 kg) and about 15″ (38.5 cm) tall, it’s especially easy to move to different spots. Just like the other HPA models a handy carry handle is built into the rear top section. Following removing it from the box and removing the plastic bag it’s time to open it up. There’s a notice label on top of the purifier near the controls instructing you to remove the filters from their bags before use. Some people might see this as an annoyance (as some other brands don’t do this) however I can appreciate that Honeywell keeps the filters 100% fresh and undisturbed this way. It didn’t take long at all – just a few minutes and I was done. You’ll need to insert the pre-filter into the rear cover where its held by inserting into the tabs. It’s very easy, honestly. Unfortunately, unlike other HPA models I’ve reviewed, there’s no built-in quick start guide. Perhaps it’s because there’s limited space due to the size of the purifier. However, it’s disappointing to see other models feature this except for this model. I’m somewhat certain that because it’s not needed due to the simple controls, but it would have been nice. Additionally, the quick start guide on other models that can be accessed by pulling on a tab in the body contains the customer service phone number. The HPA060 has a simplified control panel with a rotary fan speed control and filter replacement reminders. This is in contrast to larger models like the HPA160 which have touch and push button features. For those you’ll have to pay more. Despite this, it’s super easy to use and it looks great. Like some of its competitors, this model uses a rotary control for fan speed. However, unlike many, the switch positions are illuminated when switched on. 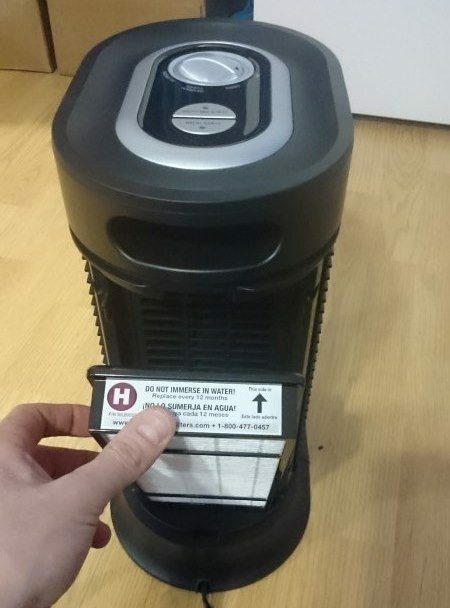 There are two filter replacement reminder indicators, which is rather unique for an air purifier in this price range. It’s a great feature and you need not worry about having to spend a lot of money to replace both filters when only one needs replacement. As you can probably guess, it’s super easy to operate. Simply rotate the fan speed control to one of 3 positions. (Well, that’s what the company calls them, anyhow). I don’t quite understand why, why Honeywell has named the 3 fan (cleaning) modes Germ, General, and Allergen. It seems to me, after using it, that it’s really just low, medium, and high fan speed settings. I checked the owner’s manual but it doesn’t clarify this. The HPA060 is small and has a limited ability to move air, so not surprisingly the Clean Air Deliver Rate (CADR) is lower than for larger models. The CADR is a laboratory proven way of demonstrating how quickly an air purifier can clean the air in a room – the higher the score, the better. The HPA060’s Clean Air Delivery Rate (CADR) is typical for small-room air purifiers. 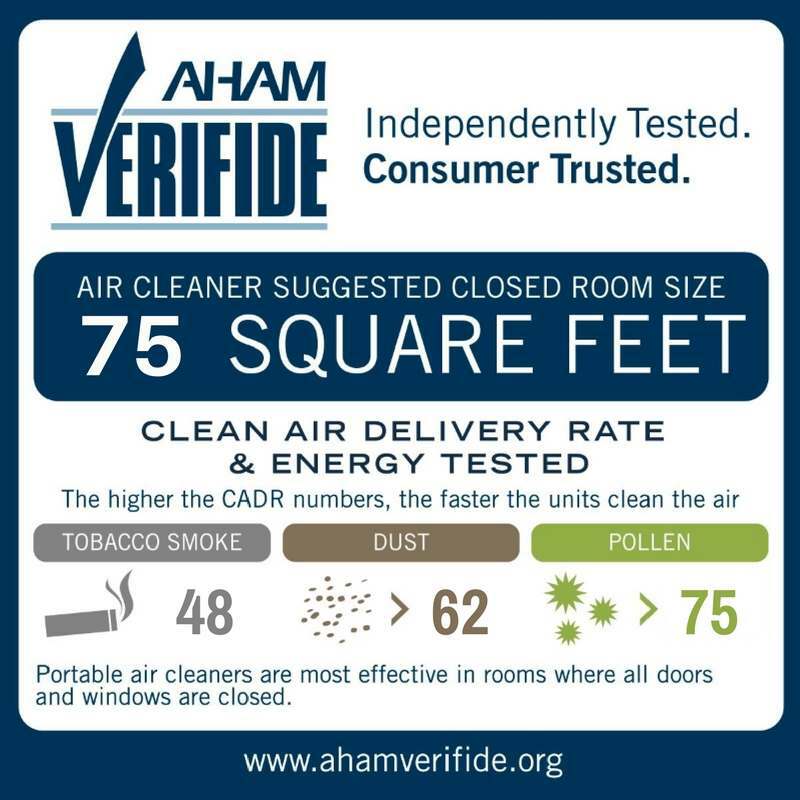 It’s not suitable for rooms above the recommended size (75 square feet) and does have less effectiveness for smoke. One reason is not just because of its size but smaller purifiers simply can’t move air well. This is a rating used to evaluate 2 similar models when shopping. It’s based on the amount of air cleaning it can perform depending on how quickly it can move air. Naturally, bigger air purifiers therefore have high ratings. Smaller air purifiers like this one and those from GermGuardian have lower CADR ratings typically. 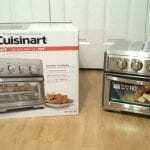 They can’t move air well due to their size – that’s a tradeoff made when using a smaller, less expensive model. For small rooms, however, they’re still an option. There’s a very convenient carrying handle built into the rear of the body. It’s a great little feature that some products in a similar size don’t offer. I measured the weight at about 6.6 lbs (about 3 kg). There weren’t any problems whatsoever moving it from spot to spot. Honeywell has added a nice feature to make it portable – there’s a carry handle area on the top rear. That’s a nice touch which is also shared by some of the GermGuardian products as well, but not for their comparable AC4100 model. For cigarette smoke, unless it’s in a sealed room, I wouldn’t recommend this model but instead the HPA160, with a much higher CADR rating for that particular problem. That being said, it will still work to remove smoke odors and elements in the air. On the other hand, it worked well for my dust and other air quality problems. Honeywell notes that when used in the suggested room size it will purify the entire room in 5 hours. It works well and I’m happy with it considering its size limitations. The pre-filter caught a lot of dust as I seem to have a constant supply of it in my home. It’s an effective purifier, it’s just that you must use it in the correct size room. The HPA060 uses a standardized Type H Honeywell filter (white) also used by some other models as well. The Type B pre-filter (black) is separate and is held in the rear cover as shown. One of each is needed during replacement, although 12 months is the recommended replacement time for the H filter. A High Efficiency Particulate Air (HEPA) filter is used with the pre-filter which catches larger elements like hair and larger dust. It can additionally trap odors over time as well as it has a chemical treatment. 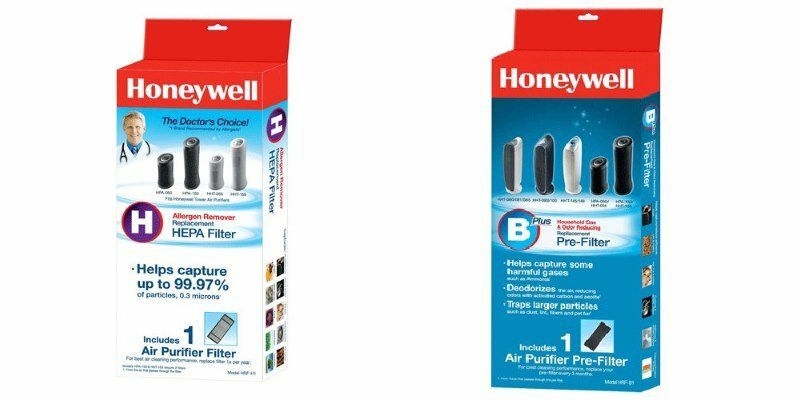 Modular filters are designed so that Honeywell can share a standard size filter in different quantities between several different models in the product line. Before using it, you’ll need to remove the filters from their bags. Here you can see how the bottom of this one is inserted and then it is leaned into place. At the top is a retention tab which clicks into place and holds it securely. The purifier is shipped with a Type H true HEPA filter you must remove from its plastic bag and insert into their opening. Similarly, the pre-filter must be removed from the plastic bag and inserted into the filter cover/grill as I mentioned above. I found the process easy and it only too a very short time. The odor reducing pre-filter that’s included is basically a rectangular section of a filter material. Tabs in the rear cover hold it in place. This is a somewhat thin, black rectangular section of material which traps larger particles like hair and dust before reaching the HEPA filter. It’s also treated in order to reduce odors and airborne chemical vapors. When it comes to odors, you need to understand that the Honeywell purifier will help, but it isn’t an instantaneous solution. It takes time for the purifier to cycle the air and remove odors. Opening the rear cover is very easy. Just 1) push down on the release tab with your thumb and 2) swing the cover down, then pull it out. There are 2 tabs at the bottom which fit into slots which are used when reinstalling it. Repeat this in reverse after replacing filters. The release tab will snap at the top indicating it has locked back into place. Honeywell recommend replacing the HEPA filter every 12 months or so and the pre-filter every 3 months. By using a pre-filter the main and more expensive filter’s useful life is extended. However, pre-filter are often replaced every 3 to 6 months or so depending on use. They have a limited time during which they remain effective for absorbing odors. In this case, expect to pay a bit less than $20 for the H filter (see here) and around $9 for the B (pre-filter) one. In this regards the Honeywell comes out ahead, as many competitor’s products require replacing both at one time as they’re built together. What I really like is that it has separate replacement reminders for the HEPA and pre-filter elements. Honeywell’s design is different and many, if not most competitors don’t have the same. When one or both are illuminated you should check the filters. The reminder indicators are cleared by pressing a button and holding it for about 2 seconds. The light will then turn off and the reminder will be reset. Note: You can also replace filters before the reminder occurs according to the manual. Purifier switched off, press and hold each button separately for 5 seconds. The indicator lights will illuminate. Then again press and hold that indicator light until it goes off. After doing so a reminder is returned to its reset state. It doesn’t produce any ozone. The topic of headaches and air purifiers is actually a highly researched question on the internet. As I explain more in this post, an air purifier that only filters the air can’t produce any emissions that might trigger them. Primarily it’s important to understand that the HPA060 simply filters the air. It can’t add anything to air, give off gases, or create any irritants by itself. It won’t cause headaches. This model is perfectly safe and there aren’t any health concerns to worry about. What I find nice about it is that it makes finding customer service telephone number easy. In case you’re curious, here’s a download link for the HPA060 owner’s manual. Using this sound level meter to measure volume, I recorded the volume levels at 1 meter (3.28 ft) from the purifier. Overall, it’s pretty quiet and I think it does well. However, similar to its rival GermGuardian AC4100, there’s a distinct whirring sound coming from the motor. In other words, it’s not “whisper quiet” but it definitely isn’t loud or disturbing. In my opinion overall it’s good and is pretty quiet. For those of you who are like me and have super-sensitive hearing, you may want to relocate it if possible before sleeping. Otherwise, it sounds as you’d expect for a smaller purifier. As I’m fairly sensitive to light and sound when sleeping, I make sure to check brightness levels in the dark. Blue LEDs like those used on this model are often too bright. This wasn’t too bright but did add light to the room. In one of my tests I used in a darkened room just as I’d do at night when sleeping. Overall, I found the indicator lights aren’t too bright. However, with light emitting diode (LED) indicators, especially blue ones, a small amount goes a long way. I could still a bit of light in the room and on the ceiling. If you’re sensitive to light like I am I’d recommend covering it up. Sadly, there’s no illumination dimmer like the larger HPA200 has. It’s a shame but given the price range perhaps I can understand. All in all, I like it. The HPA060 is a solid, well made purifier that’s a great choice for small rooms. Just understand that for small air purifiers in its price range compromises must be made. There are trade-offs between it and more expensive products. Despite these things, I wouldn’t hesitate to recommend to anyone except those who need a germ killing feature. I think you’ll like it as much as I did. You can read more and find a good price over at Amazon. A well made and good quality air purifier for small rooms. Fair value but slightly outranked by the competition. The Honeywell line of HPA air purifiers are stylish and well-made; this one's no different. Filters are easy to install and readily available. Cleaning performance is good (for its limited size) when used in 75 sq. feet rooms. Operation is extremely easy and the illuminated dial is a nice touch. No auto-off or touch controls are offered like its siblings, so you'll have to pay more for that. While not as effective for cigarette smoke as its larger siblings, I recommend it for people who need clean air in a small space. For the best value however, be sure to check out the rival GermGuardian AC4100.